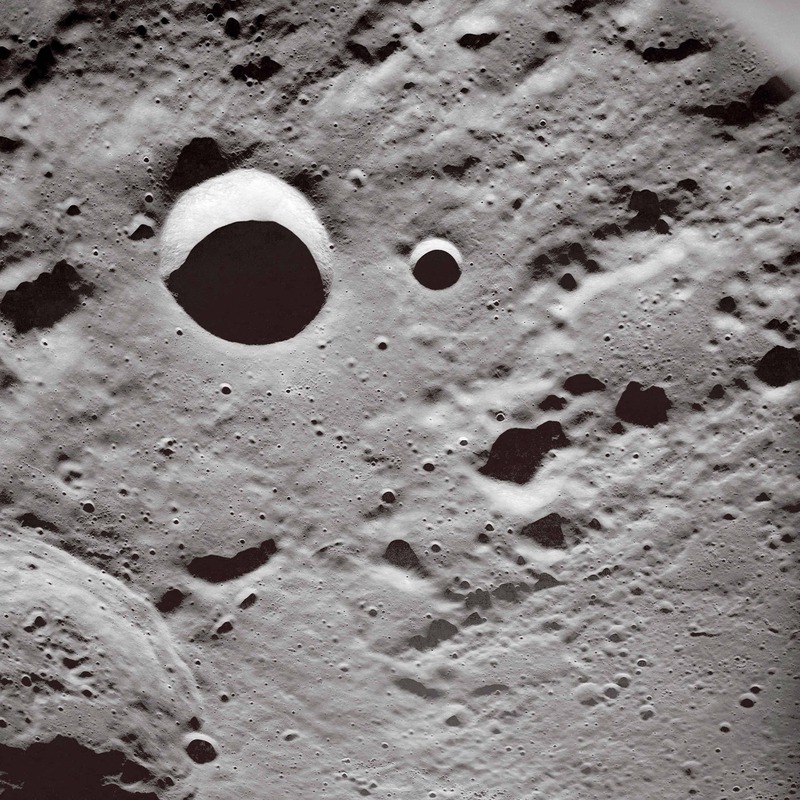 Small meteorite impacts are releasing water from the Moon’s subsurface, a new study finds. Researchers now believe that a small amount of water can be found beneath the lunar surface, dating from the early days of the satellite’s evolution. This oblique view of the Moon’s surface was photographed by the Apollo 10 astronauts in May of 1969. When the Apollo missions brought back samples from the moon, researchers analyzed them and found that the moon was formed without any native water. However, a decade ago, trace amounts of water were discovered in the lunar non-polar areas, and recent observations by Cassini, Deep Impact, Lunar Prospector, and Chandrayaan-1 indicate the existence of an active water cycle on the Moon. In addition, an enhanced concentration of hydrogen, which seems to indicate larger water ice deposits in the permanently shadowed craters of the poles was detected by the Lunar Prospector Neutron Spectrometer (LPNS). Researchers have attributed the origin of the water to solar wind and meteorites, but even so, it’s unclear why the water appears on the lunar surface in some places. In a new study published in Nature Geoscience, researchers propose a new cause for this: meteorites. 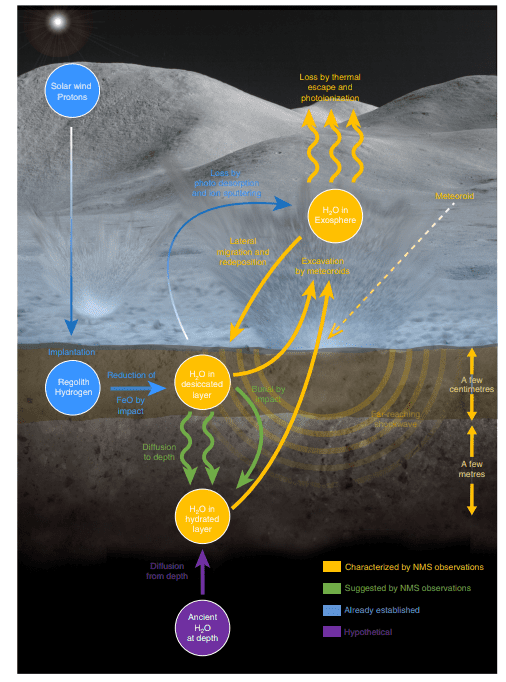 The lunar water cycle as proposed in the study. The cycle relies on a desiccated layer overlaying hydrated soils. Hydrogen from solar wind is the main source of water production. Synthesized water diffuses vertically, and can be sequestered in the hydrated layer or lost at the surface. Image credits: Benna et al / Nature Geoscience. Researchers led by NASA’ Mehdi Benna found that the timing of 29 water releases is associated with the Moon encountering known meteorite impacts. The study also suggests that a very small amount of water is pervasive in the lunar subsoil, where it was preserved from early in the Moon’s history. When meteorites whack the lunar surface, the impact brings out some of this water. According to their calculations, the uniformly present at concentrations up to about 0.05%. However, the water pushed outside is lost and never recovered by the moon. Researchers estimate that a total of 200 tonnes of water are lost every year. These findings may lay the groundwork for future investigation into the origin and fate of water on the Moon, and might also be useful in the potential establishment of a human colony on the moon.